Meet Fisher Michelsen. Fisher is an 6th grader at Cunha Middle School in Half Moon Bay. He is a graduate of our 26 week Intensive Garden Program (IGP) at Hatch Elementary that he attended in 2nd and 3rd grade. He says it is hard to remember the details of the program since it was, “a long time ago” but he distinctly recalls making veggie stir fry, “right over there” as he points to the outdoor kitchen of the garden. Fisher also attended 2 weeks of summer camp at our farm in El Granada. Fisher’s mom, Amy Risk, says The HEAL Project program is what sparked Fisher’s interest in gardening and plants. Soon after graduating from the program, Fisher planted a garden in his backyard and began researching what to grow and when. He told me he would try to plant all sorts of things and would pick out seeds from Hassett Hardware. Amy assured me that this new hobby was all Fisher. He spent hours reading about gardening, planting seeds, watering, weeding and harvesting. She said she is so thankful for The HEAL Project because she isn’t sure he would have found this interest otherwise. As Fisher’s garden flourished, he and some friends who also graduated from IGP started a company, Green Co. This young group of entrepreneurs would harvest kale, mint, and potatoes from their garden and sell it door to door. “I made 15 bucks in an hour or two!” Fisher boasted. Green Co. was just the beginning of Fisher’s exploration of the plant world. 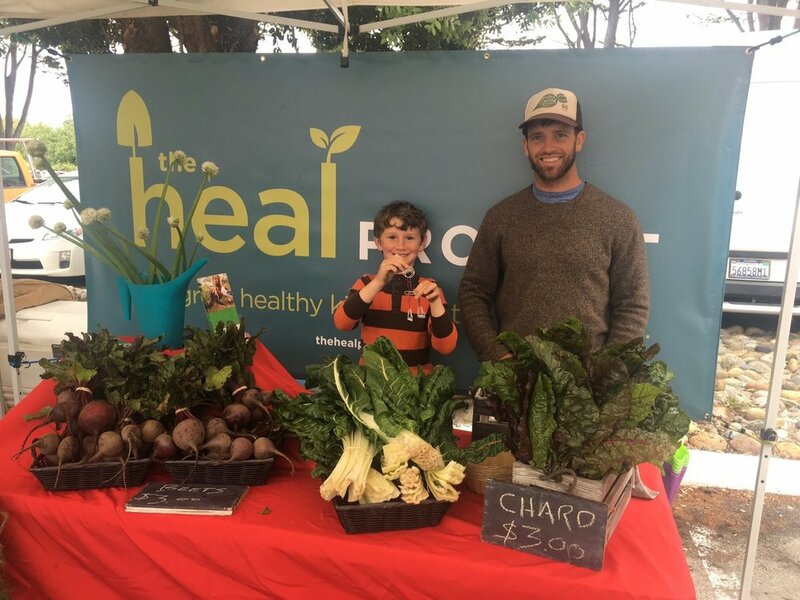 Amy and Fisher won an auction item during The HEAL Project fundraiser, Spring Ahead, to learn about herbalism from local herbalist, Suzanne Elliott. “This opened another door.”, Amy says. Fisher became interested in the medicinal uses of plants and spent hours researching which plants helped which ailments. At this point in the interview he can’t help but get up and point to a plant, “This is cudweed, I could probably make a salve out this!”. He practiced making herbal salves from local plants, “which most people think are weeds!” Fisher explained. With all this new knowledge Fisher wanted to share this wisdom with others so he wrote a book. We are proud of what Fisher has accomplished and look forward to hearing what project he takes on next. All in all, we are thrilled that Fisher has taken the initiative to share his knowledge with others. If you are interested in reading Fisher Michelsen’s book on herbalism, you can find it here: Fisher’s Plant Book. Let’s be friends! Follow @thehealprojectusa on social! 🌟 Featured Chefs 🌟 We are so excited to see what the Chefs Roberto and Aaron have cooking up for Spring Ahead!